In 1972, a passionate and energetic college student founded Upstairs Audio to showcase high-quality sound & video equipment. The store is designed in a way that consumers can audition the products and think creatively about how to configure their own audio & video set-up. Customers can immediately order custom installations designed for any specification. The commitment to keep a brick and mortar business for customers to experience products hands-on, with the direct support and interaction from knowledgeable staff, remains at the core of Upstairs Audio. Come in and see us! 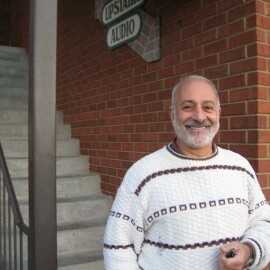 Our founder, Joseph Azar, was a college student when he started Upstairs Audio & Video in October 1972, at 919 Sumter St. across from the USC Horseshoe. Of course, the seeds for Upstairs Audio & Video were planted many years before when he, as a 7th grader, started making electronic circuits at the USC EE department, which was just across the street from his school. In Joseph’s 2nd year of college, he started a bicycle shop, another of his passions. The bottom shelf of his display was devoted to audio equipment. As both the bicycle and audio business grew, he outgrew his little 20’x20’ building, so he rented space upstairs next door for storage and decided to open a full time audio store. It is not hard to guess how the name came to be! Besides having an excellent ear for music and sound reproduction, he is also a master installer, having successfully wired and installed in environments that many others tried and failed, including a magnificent Charleston mansion built just after the Civil War. If you love music, you will want to meet him, so bring your best recorded music and come visit!